Here are just a few we did today in the house....but never fear...we are planning to do some outside when time and weather permit! And for those of you who do not know....this is my sister, Kristin. She is expecting her first child...a girl named Payton Ann...at the end of this month. She'll be here before we know it and I can't wait to meet her! 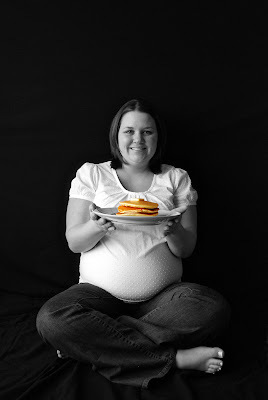 And just in case you're wondering...we did pictures with pancakes because this is the #1 food she has craved during her pregnancy! That- and bacon (not photographed). I'm not pregnanat, nor do I hope to be....but pancakes and bacon are sounding pretty darn good right now! Kristin should be a spokes woman for Aunt Jemima! !